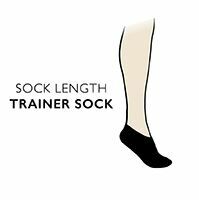 Ideal for your exercise regime, these plain and simple trainer socks will be a great addition to your gym kit. The high cotton content wicks away sweat and moisture from the skin, making sure your feet stay fresh and healthy. They provide a comfortable barrier between your feet and your trainers, while the hand linked toes for smooth seams make sure that no matter how hard you play, there's no irritation or painful rubbing on sensitive toes.